Warning: this guide reveals the exact method the author used to claim free Bitcoin CasH and exchange it for Bitcoin on the 2nd of August. While every reasonable effort has been made to ensure complete and accurate information, the author can’t guarantee a successful outcome for those following this method. Waiting for better documented methods and more familiar exchanges to offer BCH deposits is the safer play in this situation. However, as more people figure out how to sell their coins, profitability may well decrease. Bitcoin Cash (aka Bcash, BCH or BCC) forked off from Bitcoin on the 1st of August and its launch has proven rather rocky. Three days later, only 2 exchanges are supporting Bcash deposits – and its price has crashed on both. It still takes relatively a lot of time to get Bcash transactions into the blockchain and that’s due to the high difficulty of mining. Bcash forked with the same mining difficulty as Bitcoin but only a small fraction (around 5%) of its hashrate. Bcash’s first (or genesis block) took around 7 hours to be found. The difficulty adjustment process was meant to compensate for this, reducing difficulty to a level more appropriate for Bcash’s low hashrate within a few blocks. However, miners from “Genesis Block,” an aptly named, high-tech hostel in Hong Kong, apparently began mining Bcash for fun and marketing purposes. The hostel’s additional, unexpected hashpower greatly delayed Bcash’s difficulty adjustment process. As a result, Bcash blocks remain slow, although difficulty has since adjusted to about ¼ of Bitcoin’s. You can use this Bitcoin Cash block explorer to see the status of the current blocks (take a look at the bottom). If you held any bitcoin in a personal wallet (or on certain exchange wallets listed here) then congrats, you own an equal amount of Bcash too! If your BTC was held on one of the exchanges listed, the exchange will have taken care of this process for you. When you log in, you should see a BCH (or possibly, “BCC”) balance in a new exchange wallet, in addition to your regular BTC wallet. The amounts in both wallets should match, assuming you haven’t made any recent trades or transactions. If your bitcoins were held in a personal wallet, you’ll have to split them yourself. We cover splitting for Ledger, TREZOR and for the Electrum software wallet. Note that the general procedure used for Electrum is applicable to other software wallets, although the precise steps will vary. For those whose bitcoins were held on an exchange which split BCH from BTC and offers a market in BCH trading, you’re already done – sell your BCH whenever you feel like it. HitBTC requires only 2 confirmations before deposited BCH are credited to your account and made available for trading purposes. As Bcash blocks are still very slow (up to 8 hours delay), this could be a real time saver. By contrast, it appears other exchanges requires 20 confirmations before approving any withdrawals. Keep in mind that because HitBTC is one of the only exchanges allowing to actually deposit BCH many people are selling it on the platform which causes the exchange rate to be lower than on other platforms. Before going any further make sure you have a backup of your wallet at hand. Using any of these methods without a back could result in total loss of your coins. DO NOT CONTINUE WITHOUT A BACKUP! Throughout the process you will need to update your firmware, this will wipe all of the data from your device. Make sure to have a back up before moving forward or you will lose all of your coins. 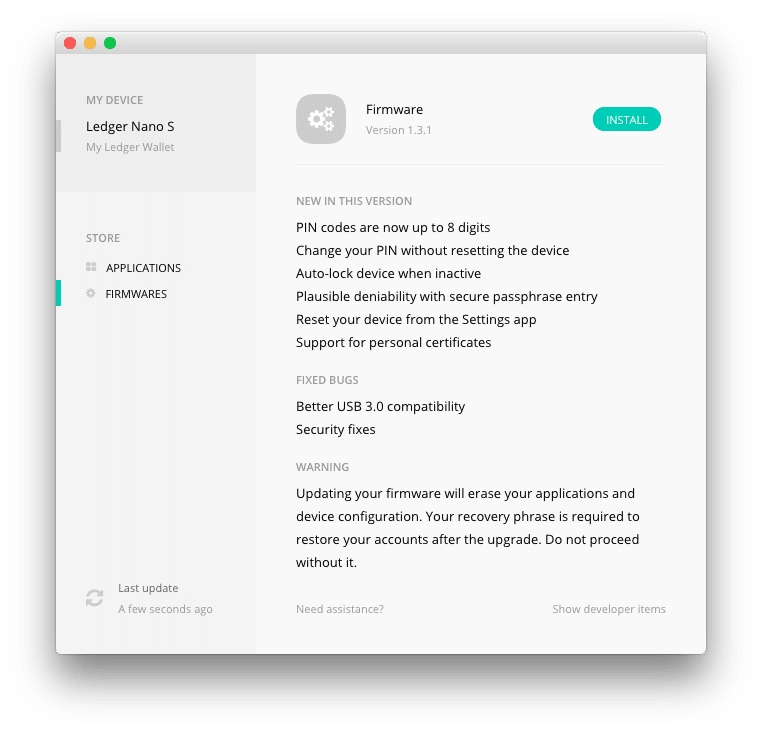 Download the Ledger Manager for chrome, go to “Firmwares” on the left hand side and click on “Install”. You will then be prompted to confirm this action on your device. Once the update is complete you will need to import your wallet from your seed phrase. The complete steps to this process can be found here. Once you have a firmware version that is 1.3.1 and above, you can move on to step 3. 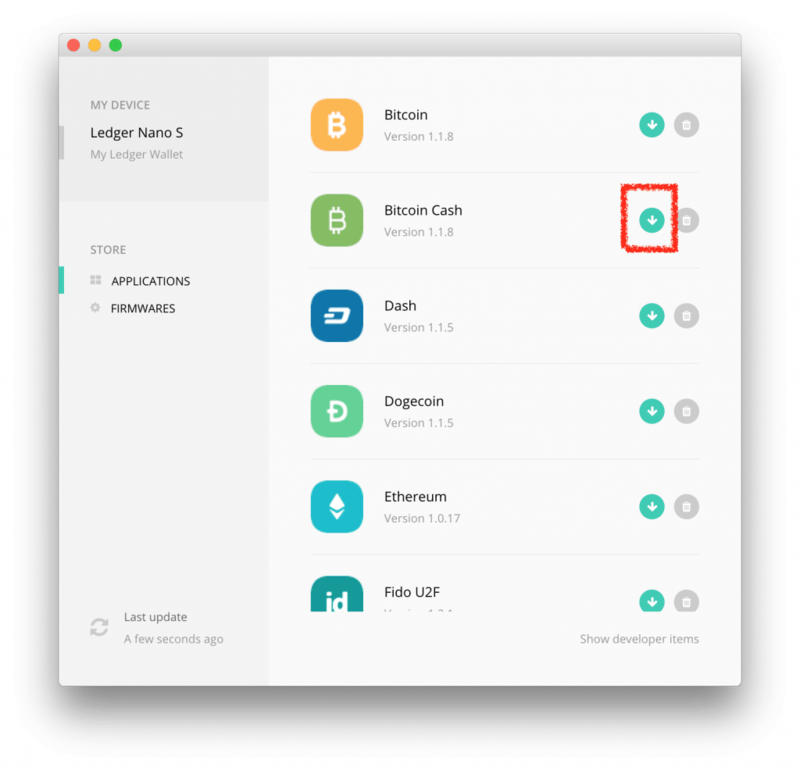 Inside the Ledger Manager, go to “application” and download the Bitcoin Cash app (2nd from the top). If you had Bitcoins before the fork, Ledger now splits those Bitcoins into BTC and BCH but keeps them on the same wallet. It’s recommended to use a separate (aka split) wallet to manage your BCH. This step isn’t mandatory but is advised. If you wish to skip this step move straight to step 6. Select “Bitcoin Cash”. The following screen will ask if you want to access the main wallet (BTC and BCH combined) or the split wallet (Only BCH). Select “split”. Go to “receive” and generate a BCH address. You will later send your Main wallet’s BCH to this address. Once you have your BCH address move to step 5. Go to “settings” – “Blockchains” and this time choose “Bitcoin Cash” and “Main”. This wallet holds your newly formed BCH along with your BTC. It’s now time to send them to your split wallet. Go to “send” and send your BCH to your split wallet address which you’ve retrieved on step 4. You can now go to “Settings” – “Blockchains” and log back into your split wallet. You will need to wait for a new BCH block to be mined until you can see that your transaction is confirmed. Once it’s confirmed you can send your BCH into an exchange or hold on to them. For the official ledger guide click here. 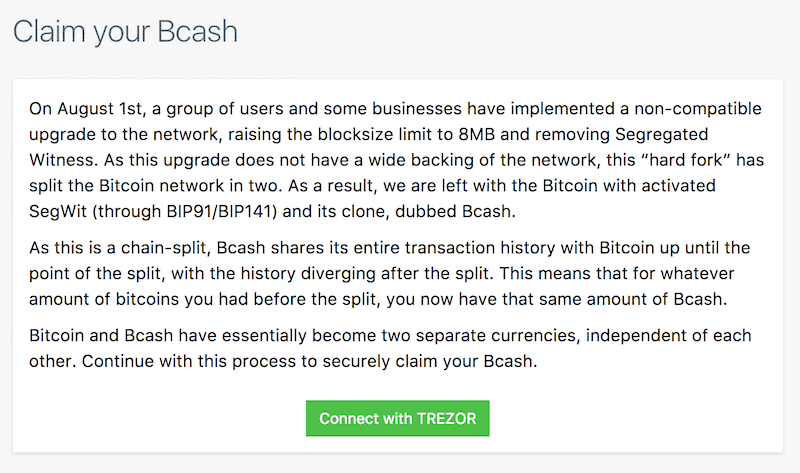 Due to only having a week to prepare for the launch of the final version of Bcash code, Trezor’s wallet does not currently support BCH (although they’re working on a fix). 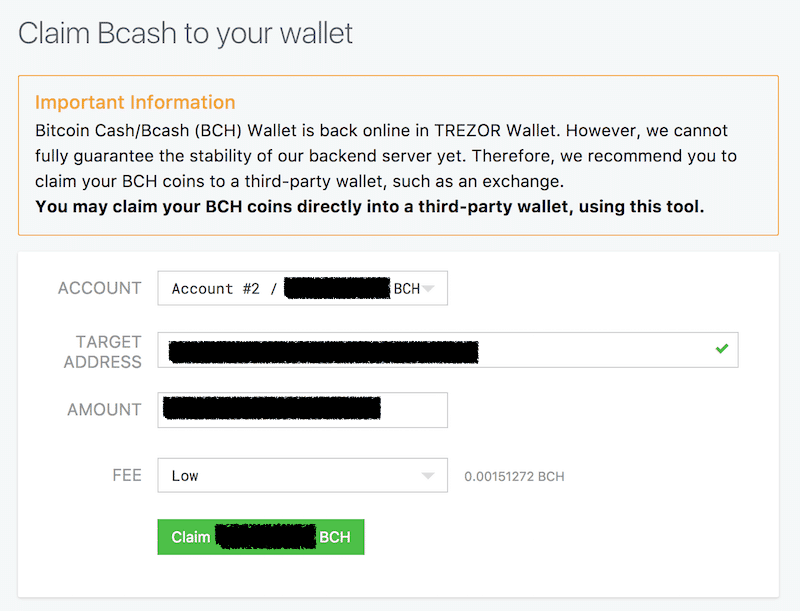 It is however possible to use an online tool by TREZOR in order to split your BCH and simultaneously send it to a BCH address. Thoroughly review Trezor’s guide to this process and check their Twitter and subreddit for any updates. Sometimes the tool is offline and recently some bugs were found in it. be anonymous and walk away safely with your funds. 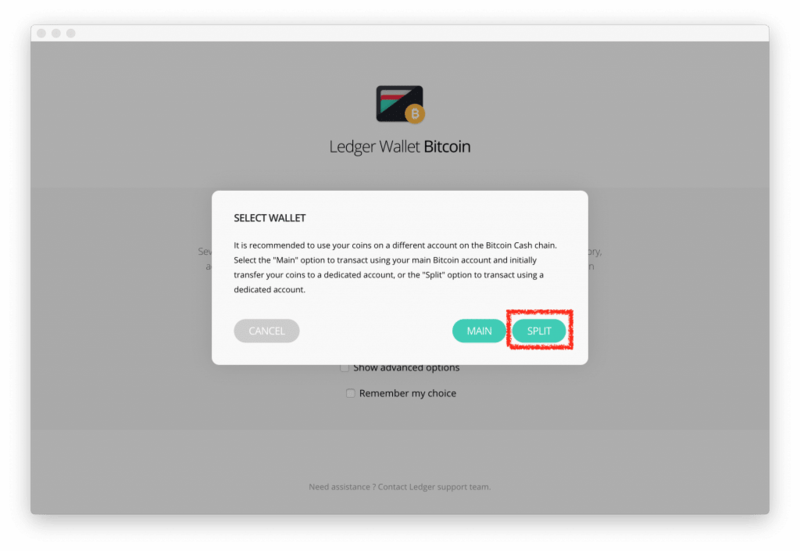 Step 3– Install the Exodus wallet and click on “Help” menu on the left panel. Scroll down to the menu items on the right and click on the menu called “How do I claim my bitcoin cash (BCH)”. Here is the original article from Exodus. On old Blockchain.info wallets Login and then go to Settings > Addresses on the left. Then find your address that has your BTC balance (which held BTC at the time of the 8/1 fork) and click on More Options, then Private Keys. After that just follow the same sequence as in the Electrum guide. In the new version of Blockchain.info you should go to security – wallet recovery phrase and write down your 12 word seed. After that just follow the same sequence as in the Electrum guide. Here’s a guide for getting your BCC from Mycelium. The order of sequence laid out in the Electrum guide will be safe for any software wallet, as far as we know. The major point to keep in mind is that you must generate a new wallet (not just a new address), send your bitcoins to the new wallet, and only then is it safe to export the private key of your old wallet into your Bcash wallet. If you’re unsure how to accomplish any of these steps, it’s best to wait for a detailed guide for your specific wallet. HitBTC is a European exchange (apparently headquartered in Hong Kong) which has been operational since 2013. They don’t seem to have experienced any major hacks or other negative events in that time, which is good going by crypto exchange standards. Step 2 – Sign in and navigate to your Bcash wallet by selecting the “Account”. 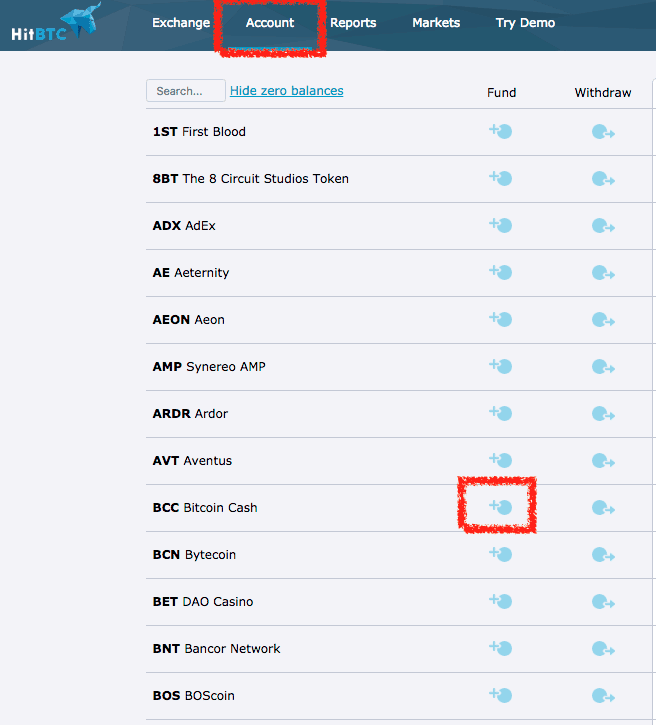 scroll down to “BCC” in the list of coins and click the “Fund” button (circle with +). Your BCC deposit address will now be generated and displayed. Note that BCC addresses look just like Bitcoin address, so be very careful that you don’t confuse the two! Step 3 – Send the BCC from your wallet into your HitBTC BCC account. Step 4 – Wait for at least 2 blocks to be mined on the Bcash network. 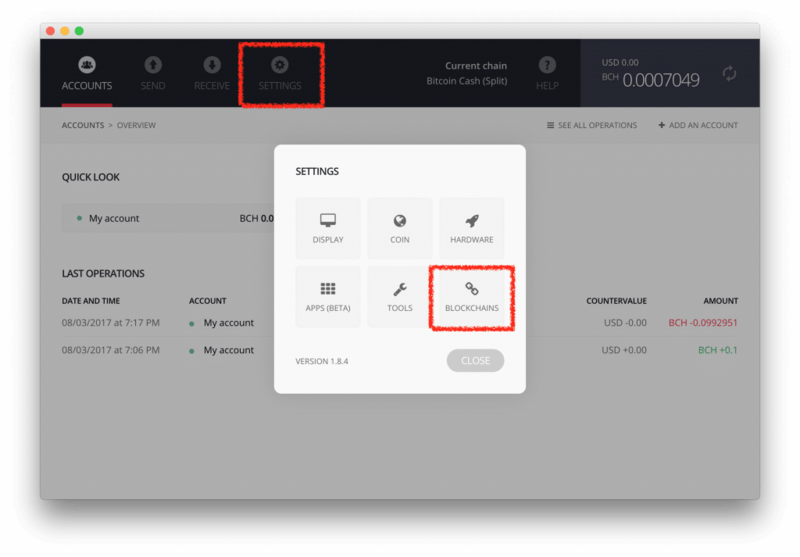 Step 5 – Move your coins into your trading account. Click the rightwards facing arrow icon, then on the expanded bar, input or verify the amount to transfer. Finally, click transfer. 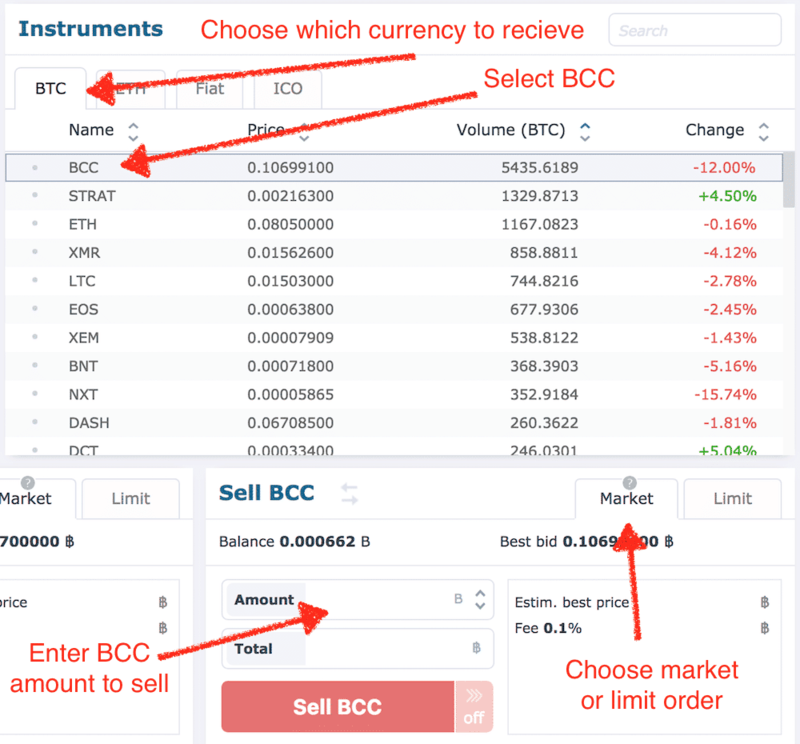 Step 6 – Select the “Exchange” tab at the top left and select the currency you wish to sell your BCH for. Make the exchange. The simplest way to sell is via a market order. This will sell as many BCH as you specify at the best available price(s). There are other types of orders which may allow you to get a better price for your BCH. Check out Limit orders too, which allow you to place a sell order for your chosen amount of BCH into the order book at a specific price. This allows you to wait for the market to meet your price, although be aware that if your price is too high the coins may never sell. In this case, you will have to cancel your active order and place a new one at a lower price level. 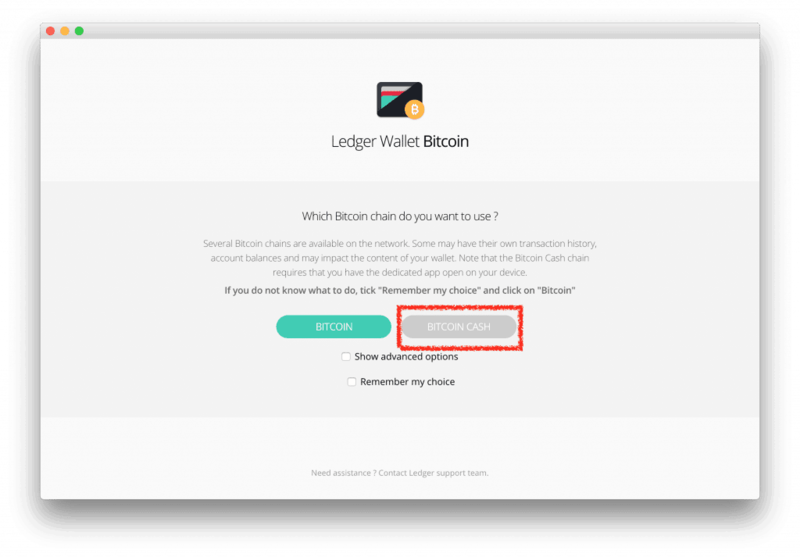 Step 8 – Withdraw your bitcoins, or other currency. Return to the “Account” tab, then transfer your BTC (or whichever currency you sold for) from your trading to your deposit / withdrawal account. The withdraw dialog will then require your Bitcoin address. Ensure that you paste a Bitcoin address from a Bitcoin wallet under your control, not the Bcash address you used to deposit funds initially! Congratulations, you’ve just increased your bitcoin holdings with almost no work! HitBTC sends out withdrawals almost immediately so you should soon be able to see your unconfirmed transaction in any block explorer. Of course, you’re not forced to sell your BCH. You may wish to hold it, perhaps because you believe in the coin’s long term prospects or think patience will be rewarded with a better price. Bcash is currently trading above $300 on most exchanges, which in this author’s opinion is high for an altcoin with no established economy, unknown developers, vulnerably low hashrate and no real technical innovations. Rhetoric aside, Bcash offers no tangible advantages over Bitcoin. The codebase has been gutted of major Bitcoin protocol upgrades, such as SegWit and Replace By Fee. Bcash addresses scaling by the relatively crude means of multiplying its maximum block size from 1 to 8 megabytes. This has the consequence of increasing operational demands across all nodes; likely increasing miner centralisation. BCH/BTC 1 minute chart with recent blocks demarcated. 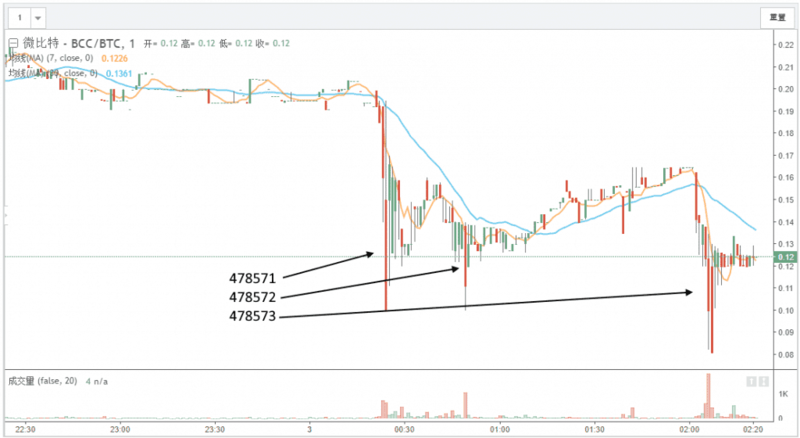 Notice that price drops coincide with volume spikes. Waiting for a block can be a tedious process. Currently, the best way to monitor Bcash blocks in real-time is via this block explorer. Bcash blocks currently take around 2 hours to find (but may take much longer).